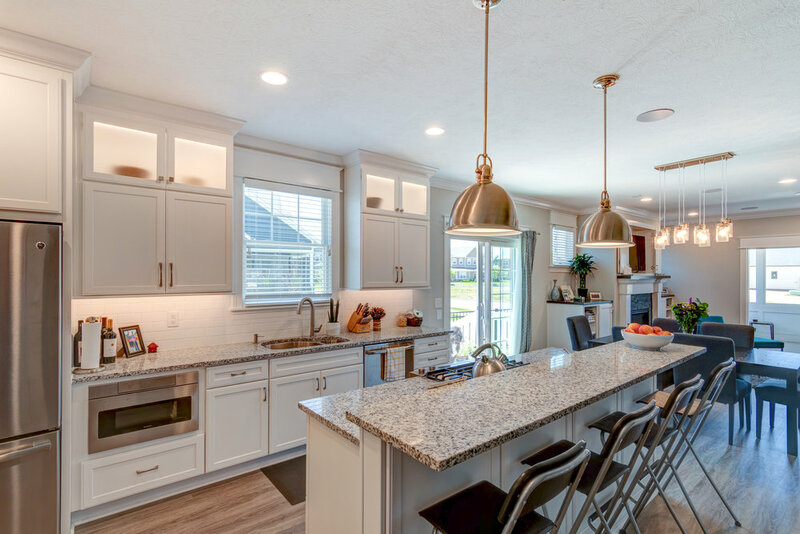 New Carmel residents, the Wieczoreks, share what life on the Monon in their new custom home is like. What made you choose to build in Sunrise on the Monon? Stephanie: When we were looking for a house, we had a lot of things that we wanted that we weren’t finding in already built homes. So, we decided to look at building and we heard about the neighborhood from some friends and it seemed like a great idea. We love the style of Old Town’s homes and we like the area a lot. Victor: We came from living downtown, so we enjoyed all of the amenities that downtown had, but it was getting to be a little bit much. Coming north was a great choice and taking advantage of everything Carmel had to offer while still being accessible to downtown. It seemed like a great little quiet area, where you still have tons of access. How did the access to the Monon Trail influence your move to Sunrise on the Monon or did it? Victor: We like to bike and run. Having access to the Monon is another way to get downtown if we wanted to or to Broad Ripple, head up North to Carmel. It’s just a fun way to stay active. Now that we have Daphne, she loves taking walks out there. Can you discuss the difference in your lifestyle since you moved to Sunrise on the Monon? Stephanie: We definitely have been able to entertain more which is what we wanted when we were thinking about the house. We had a birthday party yesterday, and we had people over last weekend. It feels like we’re a lot more social I think since we have the space to be social. Victor: Exactly, we were downtown for a year before we moved here which is a very different lifestyle, generally. Living downtown in a small apartment versus up here in the “burbs”, it’s just a much larger area. We’re able to take advantage of it and host a lot more. Even when we just have small parties, it feels like a lot more relaxed it’s not as hustle and bustle. But there is still a lot of action and activity here. We really enjoy it. Stephanie: I think it’s hard because Victor was over here, every day, multiple times every day. Victor: Yeah, I was. So, walking into the home the first time and knowing it was ours after taking ownership, that was definitely a “WHOA” feeling for us. Coming into something that was brand new, built exactly how we wanted it and that we had been able to watch the process since it was an open field, it was a really cool feeling. One of the best parts of that for me, was knowing that the people who worked on the house, Dave and Eddie, did stellar work in communication. They let us know exactly what was going on and if something had to change on the fly, they described what it was, what was going on and why it needed to change. I never felt like there was a question mark about any decision that Old Town made. I always felt like I was in the ‘know’ and I got to voice my opinion. Throughout the process, Stephanie and I, learned to trust the professionals. I know it’s a long-winded answer, but the feeling was all wrapped up in the fact that when we took ownership, I was excited not because it was ours, but because I knew from day one that it was as good as it could be and it’s just an amazing house. What do you like most about living in Sunrise on the Monon? Stephanie: I think that we’ve met some really great people here and we love having a yard. That’s one way that we meet people, through Daphne. She’s very friendly and we meet other owners. It’s been really nice to have a community feeling and community events, like Food Truck Friday and Bud and Maureen’s semiannual coffee day. Victor: Just in general, all of the folks have been wonderful and so nice. I think for being relatively young in the neighborhood it’s been great to have the apartments nearby. We enjoy it because there are younger people walking around and we’ve made a lot of friends with people living in the apartments. The location is fantastic, I love that we’re just minutes away from everything but right now we have the windows and doors open and it sounds so quiet and calm. Victor: I think I touched on it earlier about learning how to trust professionals, I think a lot of people have problems with that. Even just looking at the initial schedule, week one on Buildertrend they show every single step all the way until you're closed and some of that, to a leman like me, doesn’t make any sense. But you have trust. Mistakes and accidents happen, sure. But in our case, in the few times where that did happen building our house, Dave and Eddie bent over backwards to make sure that not only do we make up the time, but that we close a week early which is almost unheard of. So, we couldn’t be anything but happier with that. Looking around now at the house, I’m thinking about things like the trim, which I’m sure that some people have strong opinions of, but I trusted that Old Town knew what they were talking about. It helped remove the stress of being nitpicky about every little thing. The customization was there, and when I didn’t want to [customize], the trust was there which was great. 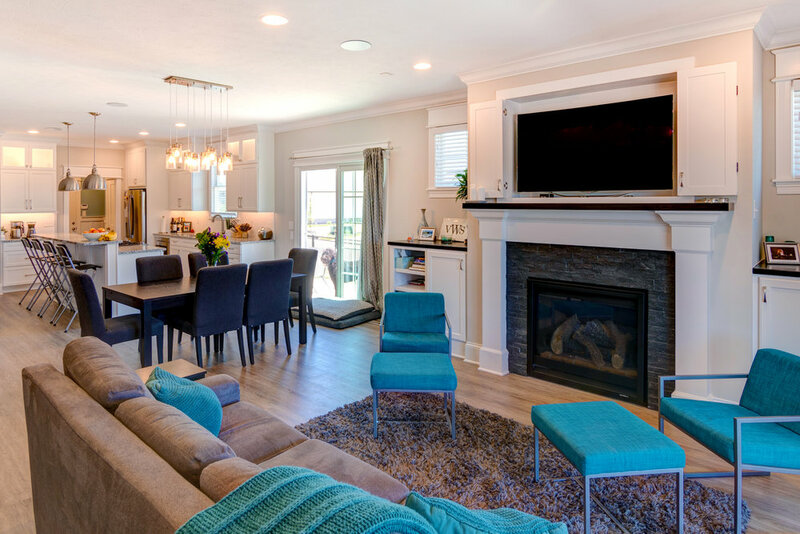 The Wieczorek family found the home design and location that was right for them. Make the move and write your own building story with Old Town Design Group at our newest Monon community, Sunrise on the Monon, in the heart of Carmel.